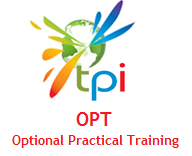 Optional Practical Training (OPT) is temporary employment that is directly related to an F-1 student’s major area of study. Under the prior rules, an F-1 student could be authorized to receive up to a total of 12 months of practical training either before (pre-) and/or after (post-) completion of studies. An F-1 student may be authorized to participate in pre-completion OPT after he or she has been enrolled for one full academic year. The pre-completion OPT must be directly related to the student’s major area of study. Students authorized to participate in pre-completion OPT must work part-time while school is in session. They may work full time when school is not in session. • Students must initiate the process by requesting the Designated School Official (DSO) at their academic institution to recommend the OPT. The DSO makes such recommendation by endorsing the student’s Form I-20 and by making appropriate notation in SEVIS, the system used to track F-1 students. • Students then file Form I-765, Application for Employment Authorization Document (EAD), with U.S. Citizenship and Immigration Services (USCIS). If approved, USCIS will issue an EAD to the student. • The student may begin engaging in pre- or post-completion OPT only after an application has been approved and an EAD has been issued. ICE records indicate that there are approximately 70,000 students currently in OPT and, of those, about 23,000 are studying in Science, Technology, Engineering, or Mathematics (STEM) fields. Some of these students will be selected for an H-1B. Others may choose to continue their education, while some will depart the United States. ICE and USCIS estimate that approximately 12,000 will take advantage of the STEM extension. • Under the prior regulations, F-1 students had to apply for post-completion OPT prior to graduation. • This rule allows F-1 students seeking initial post-completion OPT to apply during their 60-day departure preparation periods in the same way that they are allowed to apply for a change to H-1B status during their departure preparation periods. • Students may apply for an OPT extension at any time prior to the expiration date of their current OPT period. • F-1 students who receive science, technology, engineering, and mathematics (STEM) degrees included on the STEM Designated Degree Program List, are employed by employers enrolled in E-Verify, and who have received an initial grant of post-completion OPT related to such a degree, may apply for a 17-month extension. • This extension of the OPT period for STEM degree holders gives U.S. employers two chances to recruit these highly desirable graduates through the H-1B process, as the extension is long enough to allow for H-1B petitions to be filed in two successive fiscal years. • To be eligible for the 17-month OPT extension, a student must have received a degree included in the STEM Designated Degree Program List. This list sets forth eligible courses of study according to Classification of Instructional Programs (CIP) codes developed by the U.S. Department of Education's National Center for Education Statistics (NCES). • The STEM degree list is included in the preamble to the interim final rule and will be posted on the ICE website. • Note that to be eligible for an OPT extension the student must currently be in an approved post-completion OPT period based on a designated STEM degree. Thus, for example, a student with an undergraduate degree in a designated STEM field, but currently in OPT based on a subsequent MBA degree, would not be eligible for an OPT extension. • The student must have a bachelor’s, master’s, or doctorate degree included in the STEM Designated Degree Program List. • The student must currently be in an approved post-completion OPT period based on a designated STEM degree. • The student’s employer must be enrolled in E-Verify. • The student must apply on time (i.e., before the current post-completion OPT expires). • The E-Verify program is an Internet-based system operated by the Department of Homeland Security (DHS) in partnership with the Social Security Administration (SSA). • The E-Verify program currently is the best means available for employers to determine employment eligibility of new hires and the validity of their Social Security Numbers. • E-Verify electronically compares information contained on the Employment Eligibility Verification Form I-9 with records contained in SSA and DHS databases to help employers verify identity and employment eligibility of newly-hired employees. • No. E-Verify is a free, easy-to-use web-based system available to employers and in all 50 states, the District of Columbia, Puerto Rico, Guam, and the U.S. Virgin Islands. • The student files Form I-765 with USCIS, Form I-20 endorsed by the DSO, a copy of the STEM degree, and the required application fee. • Form I-765 is being amended to require the student to indicate the degree and provide the employer’s E-Verify information. • If their post-completion OPT expires while the 17-month extension application is pending, students who timely filed their STEM extension applications with USCIS will receive an extension of employment authorization after their current employment authorization expires, but for no more than 180 days. • The student must also report to his or her DSO every six months, confirming the information listed above; even if there have been no changes. • The requirement to report continues if the student’s 17-month STEM extension is extended further by the automatic cap-gap extension. • Under the prior regulation (and unchanged by this rule), an employer may not file, and USCIS may not accept, an H-1B petition submitted earlier than six months in advance of the date of actual need for the beneficiary’s services or training. • As a result, the earliest date that an employer can file an H-1B petition for consideration under the next fiscal year cap is April 1, for an October 1 employment start date. If that H-1B petition and the accompanying change-of-status request are approved, the earliest date that the student may start the approved H-1B employment is October 1. • Consequently, F-1 students who are the beneficiaries of approved H-1B petitions with October 1 employment start dates, but whose periods of authorized stay (including authorized periods of post-completion OPT and the subsequent 60-day departure preparation period) expire before October 1, are in many cases required to leave the United States, apply for an H-1B visa at a consular post abroad, and then seek readmission to the United States in H-1B status. • The prior regulations addressed the cap-gap problem by authorizing an extension of an F-1 student’s authorized stay, but they did not extend the student’s employment authorization. This extension was not automatic; a notice had to be published in the Federal Register announcing the extension. • Under the prior regulations, when this Federal Register notice was published, the student’s authorized stay was extended, but not the employment authorization. This meant the student could remain in the United States until October 1, when the approved H-1B employment began, but could not work until then. • If a Federal Register notice authorizing an extension was not published, affected students would in many cases be required to leave the United States, apply for an H-1B visa, and seek readmission to the United States in H-1B status. • F-1 academic students on post-completion OPT maintain valid F-1 status until the expiration of their OPT. Once that OPT has ended, they are authorized to remain in the United States for up to 60 days to prepare for departure. • Under this rule, the F-1 status of students is automatically extended when the student is the beneficiary of an H-1B petition for the next fiscal year (with an October 1 employment start date) filed on his or her behalf during the period in which H-1B petitions are accepted for that fiscal year. • The automatic extension terminates when USCIS rejects, denies, or revokes the H-1B petition. • If the H-1B petition filed on behalf of the student is selected, the student may remain in the United States and, if on post-completion OPT, continue working until the October 1 start date indicated on the approved H-1B petition. •The student may benefit from this provision only if he or she has not violated his or her status. For OPT Jobs Contact Tiny Planet Inc.